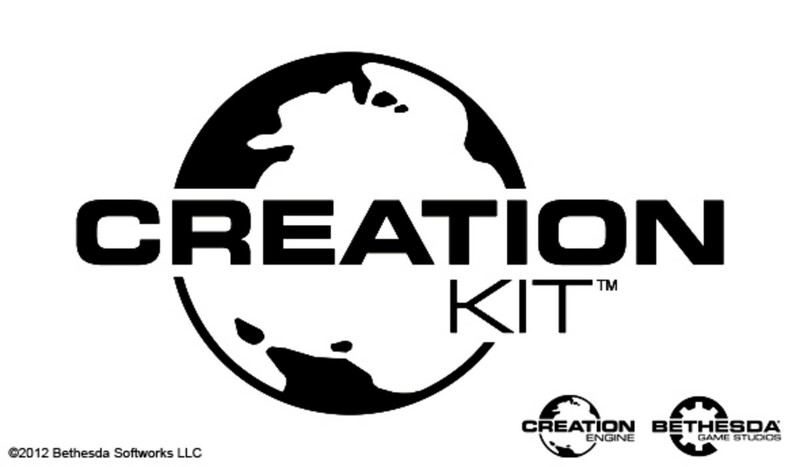 For four years, Director Todd Howard and the folks at Bethesda have been toiling away to create an experience that surpasses the lofty standards set by not only Oblivion and Fallout 3, but the best in role-playing. 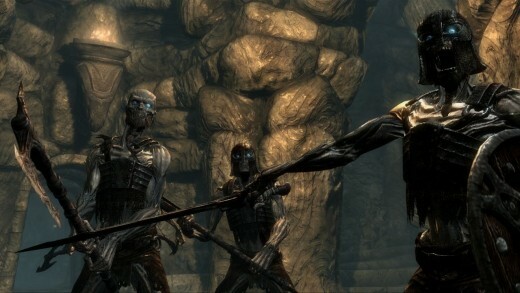 That work has paid off, as Skyrim as gone on to win numerous awards, several of which the coveted Game of the Year. 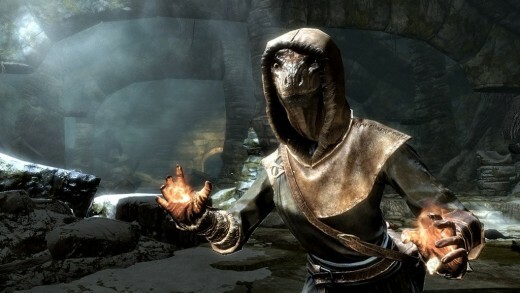 Skyrim has managed to transcend the industry it belongs to, creating its own sub-culture complete with fan fictions, late night talk show parodies, artistic tributes and numerous “arrow to the knee” internet memes. 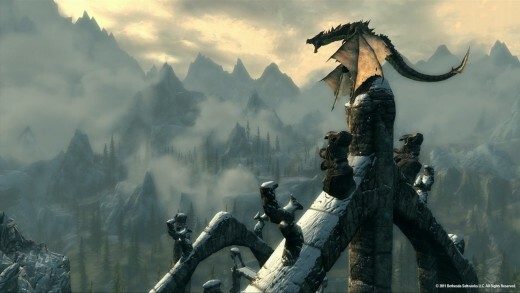 It’d be easy to dismiss Skyrim as just another craze but the game is popular for a reason; it really is that damn good. Hope you’ve got plenty of free time because you’ll need all of it and then some to see even a fraction of what this game has to offer. In my 130+ hour playthrough, I had at least over 20 active quests at any given moment. At one point, I had 20 main/side quest and 40 miscellaneous quests, some of which would evolve into side quests. There is absolutely no shortage of things to do in this game. Quests come from literally everywhere as even a simple courier message can turn into a world threatening plot. What could be in those ruins to the east? What’s the mystery of the strange marker on my map? Who’s the author of these cryptic messages I’m receiving? Buckling down and finishing a quest without taking 19 more required some serious self-control on my part as it’s so easy to get sidetracked. As hard as it may be, I urge you to finish the main quest line as quickly as possible. Side quests are tempting, trust me I know, but the main storyline is excellent and is the best in the series. Another reason to get it out of the way sooner than later is that you receive numerous abilities once you’ve finish; many of which I wish I had earlier. Don’t worry about missing anything by finishing the story early. Once the main story wraps up, the game simply continues, no end credits, so you can get back to your side quests only without the main plot hanging over you. I wouldn’t fault you though for not heeding my advice. The endless amount of side quests and the stories they contain are amazing and can be just as engaging as the main plotlines of other games. 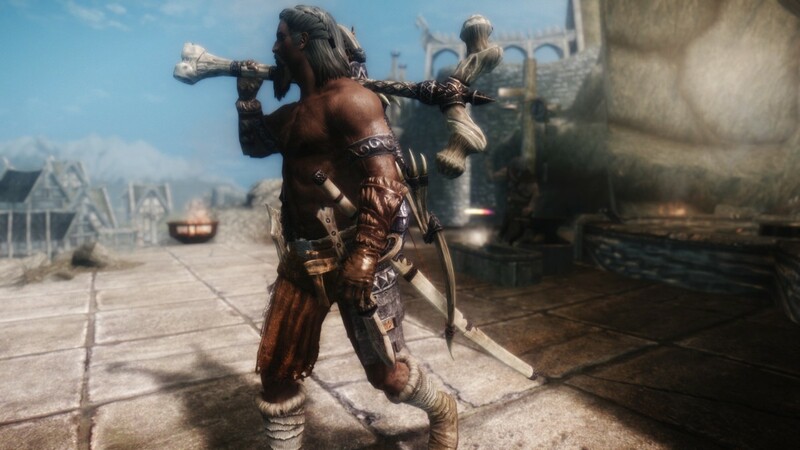 It really feels like Skyrim is a living web of interconnected narratives, with quests that will intersect with other characters and will often branch out in unexpected directions. Joining guilds has its own perks and storylines as well; joining the Dark Brotherhood being a particularly memorable one. Like the main story, I suggest finishing a guild questline before doing anything else to promptly reap their rather generous rewards. I know there’s a ton of them, but I highly recommend reading as many of the books as you’re able. Besides the fact that some of them provide skill upgrades, the stories do a fantastic job of fleshing out the world history and really give a sense that Skyrim is a living, breathing place with a long history, containing numerous fables, legends and biographies. It also helps that the stories genuinely entertaining. 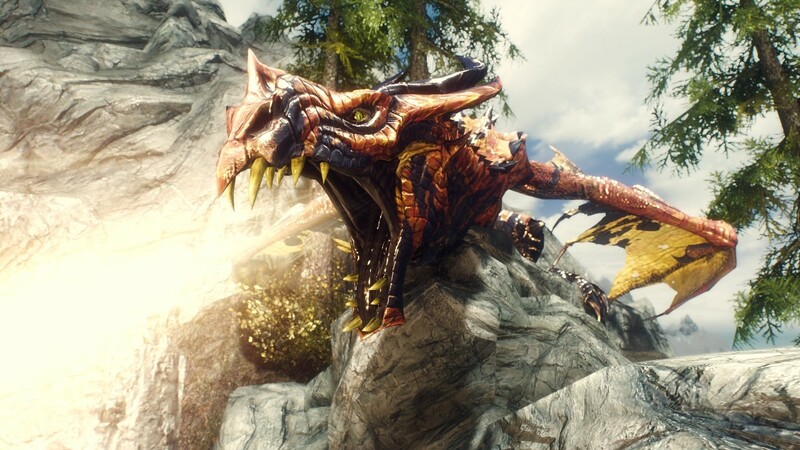 The heart and soul of Skyrim are of course the dragons. Dragons can appear anytime, anywhere, and will attack anything with a heartbeat giving the battles a nice air of unpredictability. Another cool touch is that every nearby NPC, whether friend or foe, will drop whatever they’re doing to deal with a dragon threat, playing perfectly into the idea that dragons the ultimate menace. A favorite moment of mine was getting completely owned by a group of necromages only to be “rescued” by a dragon’s arrival. The mages promptly turned their attention to the dragon (as they should), allowing me to recuperate and watch the two sides battle it out with the dragon emerging victorious. Seizing the moment, I immediately attacked the now weakened creature and killed it, making me the true victor that day. That impression doesn’t quite come across once you actually face them, as the dragons themselves can be taken down relatively easy. They put up a fight, and the dragons you’ll encounter later on provide some challenge, but there was never a single dragon fight that I was absolutely overwhelmed by. I got killed by bears more than by these so called legendary beasts. If you’re familiar with Bioshock’s weapon/plasmid set up, Skryim’s combat is very reminiscent of that. Each hand can be equipped with weapons, magic, or a shield opening a world of combination possibilities. You can wield a sword in one hand and magic in the other, dual wield weapons and magic, or the good old weapon/shield combo. Dual wielding magic is particularly awesome as you can combine spells to devastating results. Borrowing from Bethesda’s other open world game, Fallout 3, kills are now accompanied by stylish slow motion kill animations making you feel all the more badass. Enemies are much smarter this time around. You can no longer enter a fight swinging wildly like you could in Oblivion (or run backwards doing so). Enemies will strafe, block, disarm, and retreat and pursue with the speed and determination of the T-1000 making encounters a much more strategic cerebral experience. 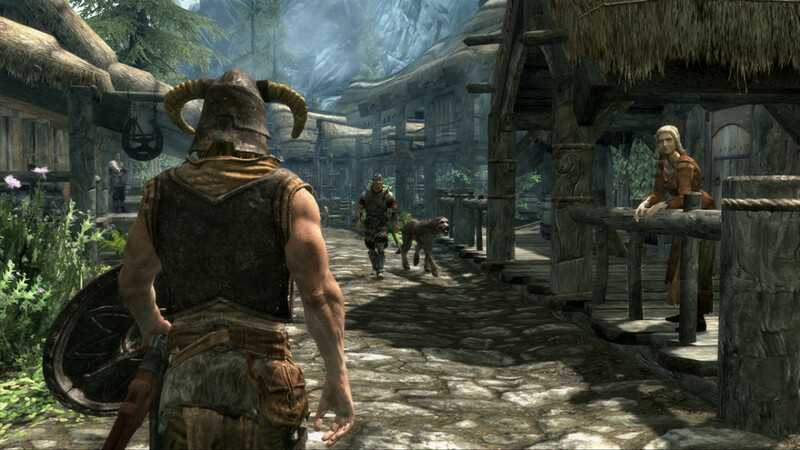 Bethesda continues to smartly use Fallout 3 as inspiration in Skyrim’s leveling system. Skill trees have replaced the old leveling system and useless skills such as athletics have been removed. Like Fallout, leveling up grants one perk to be assigned to any aptitude allowing for complete flexibility in how your character evolves. As a dragonborn you can execute dragon shouts. Shouts come in all varieties from igniting groups of enemies on fire to blowing away blizzards to even summoning lightning. Each shout is unlocked using the souls of defeated dragons and can be upgraded up to three times, furthering the intensity of the shout. Shouts require a cool down period between uses and add another layer of strategy to combat as you’ll have to mind when to use a shout and plan your approach until you can use it again. 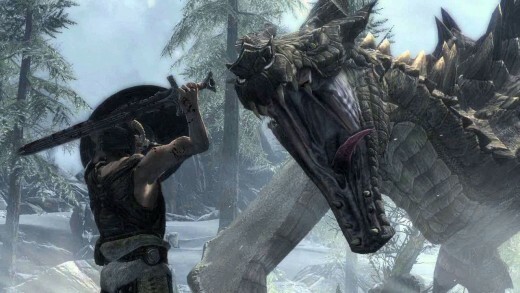 Dragon shouts are great additions and it’ll be hard to play an Elder Scrolls game without them. It might not seem important, but the menu system is vastly improved as well. The clumsy menu from Oblivion has thankfully been streamlined and accessing items, switching spells and assigning favorites is quick and intuitive. I just wish I could say the same for the stuff you keep in your chests, which can’t be organized at all, meaning you have to scroll through everything inside to find what you need. Despite what it's rabid fanbase may perceive, this is not a perfect game. 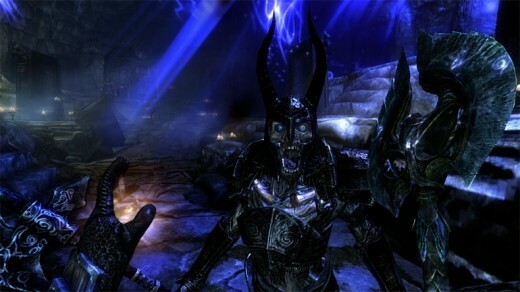 Skyrim spins an epic yarn no doubt, but much of that credit goes to the actual script than the dialogue presenting it. Bethesda has never been great at creating a cinematic experience and though they clearly tried here, it falls flat thanks to dialogue that feels stilted and often unnatural. The final boss fight is also kind of a letdown, relying on formulaic gameplay instead of throwing anything new at you. Of course, like any big Bethesda title, the game is buggier than a cave full of frostbite spiders. I played the Playstation 3 version and in my experience I suffered drops in framerate, slow down and multiple game freezes that caused me to lose progress, forcing me to load old saves. The problems have been remedied with a few patches, but some glitches have yet to be addressed and hopefully will be soon. I don’t think I’ve ever experienced a day start and end faster than during a Skyrim marathon session. 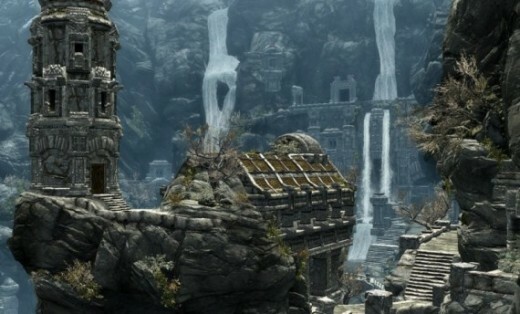 If you’re still on the fence about this game, know that Skyrim is more than just an overrated fad; it’s one of the most ambitious and enjoyable adventures in all of gaming. Most certainly. One thing Bethesda does well is expansions and I'm waiting with bated breath for an official announcement. I probably won't score the DLC as I would a full game, but I'll definitely post my thoughts on it. I have to agree with you on all accounts except the guilds. I think the Circle and the guild before you join that (forgot the name) is an insult, which was supposed to be a worthy replacement of the Fighter's Guild. The Winterhold college isn't too bad, and feels like a place of education, but being the Arch-mage doesn't give you many perks. As for the Dark Brotherhood, I can't stand it - it's the most generic assassination questline I've seen. I much prefer the patience and wit required in Oblivion. But the Thieves' Guild makes up for all this, what with it being a pack of gold-hungry scavengers, rising to become fearful. The Playstation version is known to be buggy, but the XBOX 360 version runs smoothly. 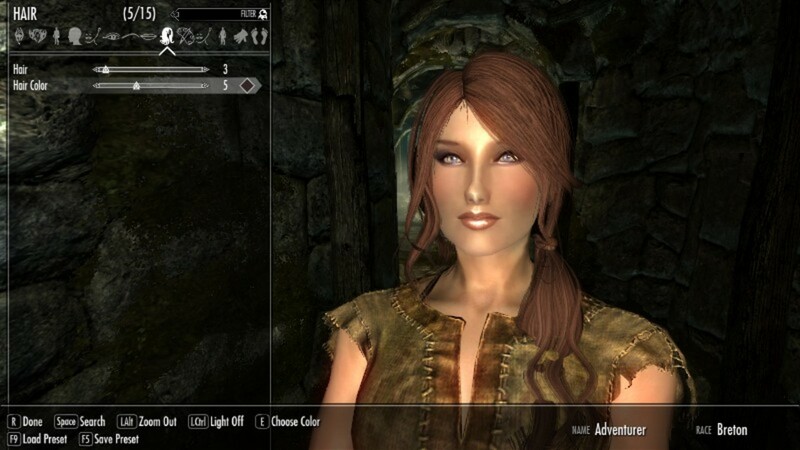 Unfortunately, it has so many missing textures and a lot of the time it's hard to tell the difference between Skyrim and Fallout. Apparently PC has neither problems. The occassional bug, maybe, but no texture issues.